The Institution of Engineering and Technology (IET) worked with the 2018 Ipsos MORI Veracity Index, which has been tracking the latest movements in Briton’s trust in the key professions since the 1980s, to have engineering included for the very first time. The profession, which employs one in five people in the UK, is seen as ‘trustworthy’ by a significant 87% of the population, closely following nurses, doctors and teachers. Trust is especially high amongst the UK’s graduates (91%) which is vital because of the need for increasing numbers of qualified engineering professionals across the UK. Mamta Singhal, spokesperson for the IET, said: “Nearly nine in ten people trust engineers – this demonstrates the huge level of professionalism and importance of engineers in the UK to support our infrastructure and continue to advance the world around us. The levels of trust are stark. 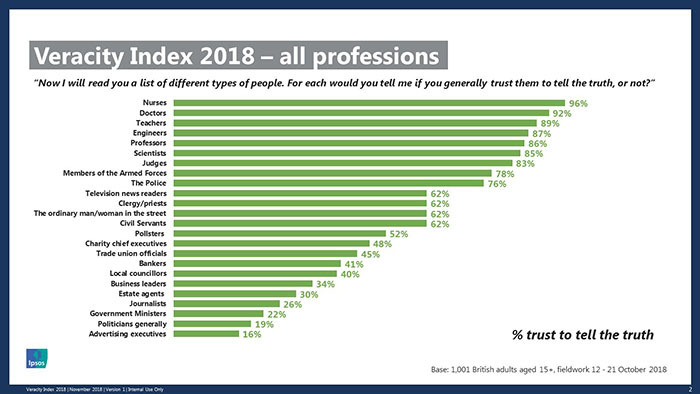 Languishing down at the bottom of the trust league with ad execs are politicians (19%) and Government ministers (22%) – perhaps not surprising in the current political climate – followed by journalists (26%) and estate agents (30%). Generation Z members trust the most professions, while Millennials are also relatively trusting. Remain supporters, Conservative Party voters, the middle classes and graduates are also more trusting of professions.